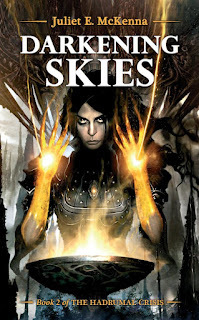 The Solaris Editors' Blog: OUT THIS WEEK: Darkening Skies - plus a first free chapter! OUT THIS WEEK: Darkening Skies - plus a first free chapter! Read the first chapter here and for FREE! He may have been hailed as a hero, but Captain Corrain now harbours a dark secret. While the Caladhrians are content to celebrate their salvation from the Aldabreshin corsairs, Corrain knows the truth - the wizard he bribed to help them has merely claimed the corsair island for his own. Will the Archmage break his policy of non-interference and crush this upstart or will the outraged Aldabreshin warlords decide that magic has no place in their world at all? In the second book of her stunning new trilogy, The Hadrumal Crisis, McKenna delves deeper into this tangle of dark magic, treachery and intrigue - raising the stakes and plunging Corrain and the widow Lady Zurenne into a web of danger that they may not escape, even with the magewoman Jilseth’s help. This rich new tale filled with pirates, politics and adventure confirms McKenna’s place amongst the pantheon of top fantasy writers with a thrilling reinvention of the genre. The prequel for the series, The Wizard’s Coming, is available as a free eBook (free to download as an ePub, PDF and Kindle) and introduces some of the characters and events leading up to this stunning new fantasy series from a major voice in fantasy writing.